Guava is a popular fruit of India. In the field of production and production, guava attains the fourth place among fruits grown in the country. Keeping in mind its multi-utility and nutrition, people call it the apple of the poor. It is extremely beneficial to health. Vitamin C is found in high concentration in Guava. In addition, vitamin A and B are also found. There are good amounts of iron, lime and phosphorus in it. Jelly and Barfi (cheese) are also made from Guava. It can be kept safe in air tight containers and kept safe. Hot and arid climate is most suitable for guava. It can tolerate heat and litter. Only small plants are affected by frost. The cultivation of guava is favourable to 15 to 30 degree centigrade temperature. It also tolerates drought well. The adverse effects of high fluctuations in temperature, hot air, low rainfall, and water cycle are less adverse. Guava can be grown in almost every type of soil, but fertile sandy loam soil has been found to be good for good production. 6 to 7.5 pH is suitable for guava production. There is a possibility of outbreaks of neck disease in the soil with pH of more than 7.5. When the shoot begins to sprout from the scion, the upper part of the root system is separated. These ranges are put in the month of June-July, approximately 80 percent of the pen is applied. This method is adopted to multiply the plants with a root root of urad. First of all, the original plant is allowed to grow for 2 years. Then in the month of March, it is 10-15 cm from the ground. The height is cut off. When 20-35 cm If the new stems of height rise, then the bark near the base of each stem is 2 cm long. The peels are peeled in the form of wide rings. On this scattered part, indolitative bacterial acid of 5000 per gallon is prepared in a lanolin paste, and the bruised part is coated on it, after which these treated prophylaxis are covered with soil, roots come in a month and a half, these roots plants Are separated after one and a half months and they are placed in karias or gamls. The main time of planting guava plants is from July to August but in places where there is irrigation facilities, the plants can be planted in February-March. Prepare the 60 × 60 × 60 centimeters (length × width × depth) pits at a fixed distance by drawing the plants after placing the plant 15-20 days before planting. These pits are 15-20 kg Fill the well prepared cow dung compost, 500 gm super phosphate, 250gm potash and 100 gm methyl parathion powders well into the soil and fill the pits 15 cm height from the surface. After filling the pit, make irrigation so that the soil is well frozen. After that plant the plants. Irrigation immediately after transplanting. Typically 5 × 5 or 6 × 6, can be applied to 500 to 5000 hectares per hectare in compact method, and from time to time, the plants are kept small by cutting and sorting and using increased controllers. This type of horticulture produces 30 tons to 50 tons. can be taken. Dense implantation method can be planted at intervals of 3 × 1.5 meters (2222 plants / ha), 3×3 meters (1111 plants), 6 × 1.5 (555 plants / ha). Irrigation of one to two years old plants of guava, from 10-15 days in heavy land and 5-7 days in light soil. Reduce the interval of irrigation in summer and irrigate it quickly. Provide water for plants over two years and making them a straw in 20 days in heavy land and 10 days in light soil. In addition to the above fertilizers and fertilizers, 0.5 percent zinc sulphate, 0.4 percent boric acid and 0.4 percent of copper suphate will be successful in increasing the production and production of plants by making the sprinkling of flowers before flowering. Neem khali 6 kg in guava By adding per plant, fruits are produced along with good quality as well as increase in production. Dung manure 40 kg Or 4 kg With Vermi compost, 100 gms of biological compost, such as azospirilum, V.A.M. And psm With the use of production and production of good quality fruits is produced. Nutrients that take nutrients in guava, around the stem and 30 cm. Is in depth. Therefore, while keeping manure, keep in mind that manure, 15-20 cm in the spread of the tree. Make a plate in depth The quantity of cow dung manure, phosphor and potash and quantity of nitrogen before the end of the rainfall in June-July and the amount of remaining nitrogen before September-October. Let the plants shape the work of cutting-sorting in the initial year. To plant the plants, first they should be 60-90 cm Let’s grow upright. Then after this height 15-20 cm Choose 3-4 branches on the difference. After this, harvesting and sorting the top and edge branches of the main stem, so that the shape of the tree is controlled. Separate dry and diseased twigs from large trees. Keep removing the whiskers from the surface of the ground around the stem. Cut off the main and secondary branches of old plants whose production capacity has reduced, so that new branches will come and the production capacity of old plants will be increased. Guava trees should not be irrigated from February to mid-May. Thus, during the summer season (April-May) the trees fall to relax and leave their leaves. During this time, trees can preserve food in their branches. In the month of June, irrigation is done after properly planting of trees and fertilizing. After 20-25 days the flowers grow in abundance in the tree. Fruits mature during winter. To give sunlight to the roots, the upper soil around the torso (45-60 cm radius) is carefully removed. This action decreases the supply of soil moisture, resulting in the leaves falling and the tree goes to rest. After 3-4 weeks, the exposed roots are covered again by soil. After this fertilization and water is given. The tree that is direct to the tree is very less productive, such trees that can be folded from the edges of the ground by tilting the branches. In this way passive buds are activated and they start giving flowers and fruits. The winter crop is much better in quality than the monsoon crop. Farmers often drop the flowers of the monsoon crop to get a high quality winter crop and higher price for the same in the market.. These growth regulators, such as Naphthalene acitic acid (NAA), Naphthalene acetamide, have been found to be effective in manipulating the flowering and harvest season. After 120-140 days of flowering, the fruit begins to ripen. When the colour of the fruit starts falling light yellow, then it is harvested. Every year 400 to 600 fruits are obtained from a full grown guava plant, which weight 125 to 150 kg. Its storage capacity is very low. Therefore, they should be sent every day and send it to the market. This is the most destructive disease of guava. Symptoms of this disease are first seen in years. The leaves of the patient trees are brown and the tree is withered. The branches of affected trees start drying one by one. This disease spreads rapidly in red litterite and alluvial soil. Treat the diseases of plants / trees pests of this disease by mixing one gram benlet or carbendazim per liter of water (20 liters per pit). 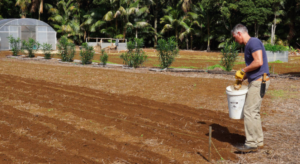 Reduce the outbreak of disease by mixing lime, gypsum and organic compounds in the soil. Bark Bhakta Worm: The worst damage to Guava is caused by this Worm, the wick worms eat the bark of the stem and makes a hole in the stem. After eating bark leaves a type of black residue that remains sticking to the affected parts. For prevention of this, put the cotton wool in pores or kerosene from petrol or newwon, and close the mouth of the hole from the wet soil.